Long time no speak! 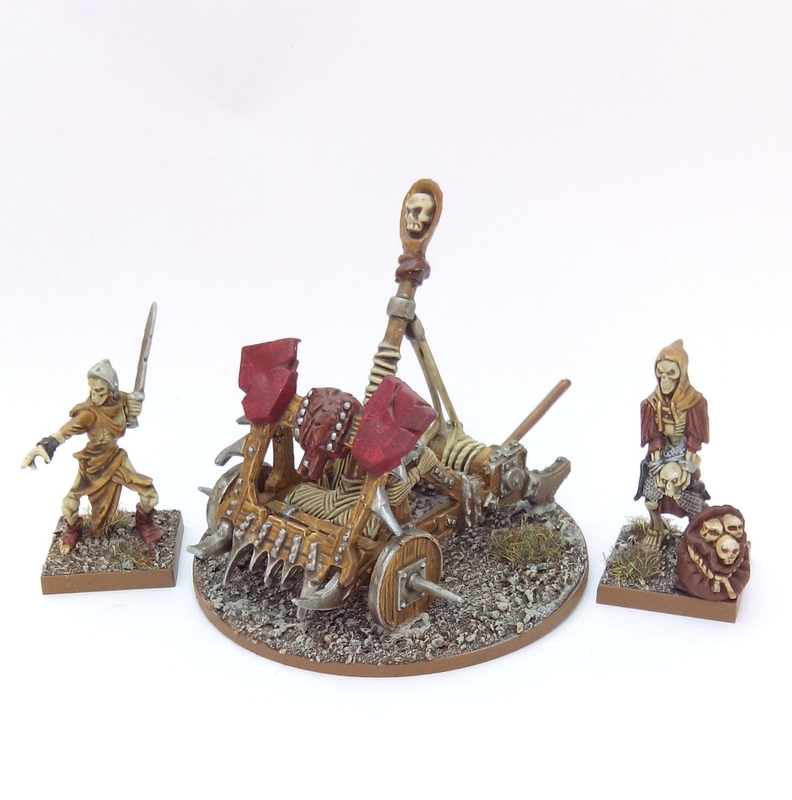 Last time I talked about my desire to try and play KOW this year. My gaming group all regularly play RPGs, boardgames and the occasional card game but never wargames. The group have expressed interest in playing but none of them paint or collect miniatures. I don’t mind painting whole armies for them to borrow for our games but getting so many miniatures table ready in the time I have is a daunting prospect. I’d seriously need to increase my painting output to facilitate this any time soon. The sensible option would be drop scale to 15mm or even smaller to 6mm and play HOTT but I can’t bring myself to do it. 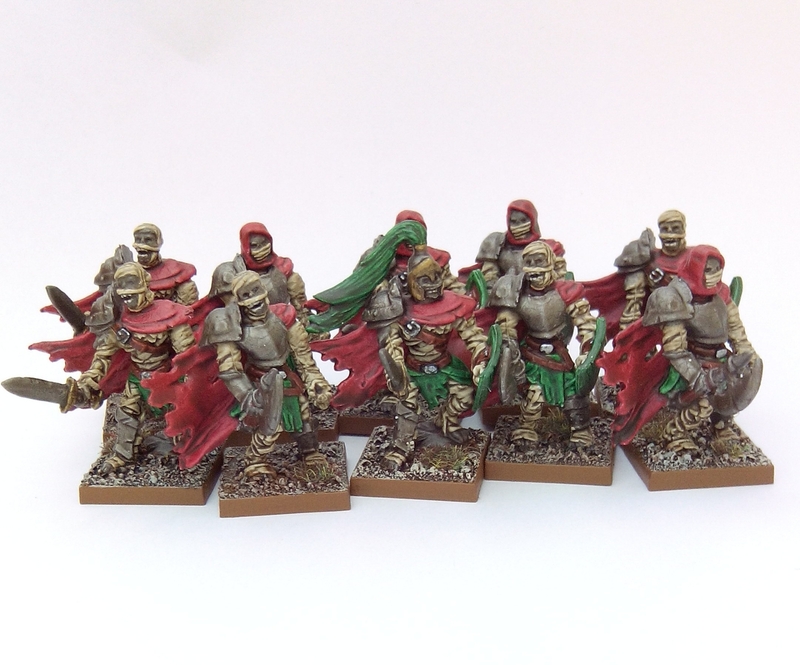 I want to play KOW or Warhammer in 28mm. Back in the mists of time when I painted in my 20s I didn’t have the commitments that I now have having reached my mid 40s. Whole evenings, weekends and holidays from work could be utilised for hobby time if I wanted to – and particularly through winter I did. By contrast my real life now is infinitely richer but it’s left me time poor from a hobby perspective. Any painting I do is limited to the hours after my young kids have gone to bed, and that includes weekends too. My breaks from work coincide with the school holidays and my wife so I can obviously spend time with my family. Given the time constraints above the quantity I’ve produced since starting painting again has been okay. However, I know it’s never going to increase substantially without some serious changes to increase productivity. 1. All my kit is packed in storage boxes dependant on which stage of the miniatures I’m at – assembly, painting, basing etc. I also have a few duplicates like brushes, knives etc in these kits so I don’t have to stop and pull stuff out from elsewhere. 2. I construct units in one sitting so there’s no half made figures hanging around, the glue has chance to dry overnight and the whole unit is ready for undercoating when I start again the next night. 3. Spray undercoats save time against hand painting. 4. Employing batch technique for painting colours, basing and varnishing saves time too. 5. I utilise drying times by having something else ready to do but without overstretching myself. That way things I start (usually) get finished. As you can see I’m not really painting individual miniatures but utilising wargamer style ‘regiment’ mass production. From an individual model point of view I’m not entirely happy with this. There have been miniatures I’ve painted that I feel deserved more time and effort than I’ve given them. With this in mind I’ve decided to continue treating rank and file troopers for games like Frostgrave to this type of approach but to spend more time on ‘character models’. With regards to rank and file wargaming troopers I’ve been intrigued by the ‘Dip Technique’ for some time now. Part of me feels it’s a bit of a cop out, especially as I have managed to paint several large armies in the distant past of the late 80s to late 90s in the ‘traditional way’. Other parts of me, the pragmatic and realistic sides, realise it clearly has its place for putting large quantities of figures on the table in double quick time for wargaming. I don’t think this technique is something to be attempted with expensive resin or metal miniatures – to be honest I don’t think I’d like to do it with some of the decent plastic kits out there either. So what would be the best type of miniature for this technique? 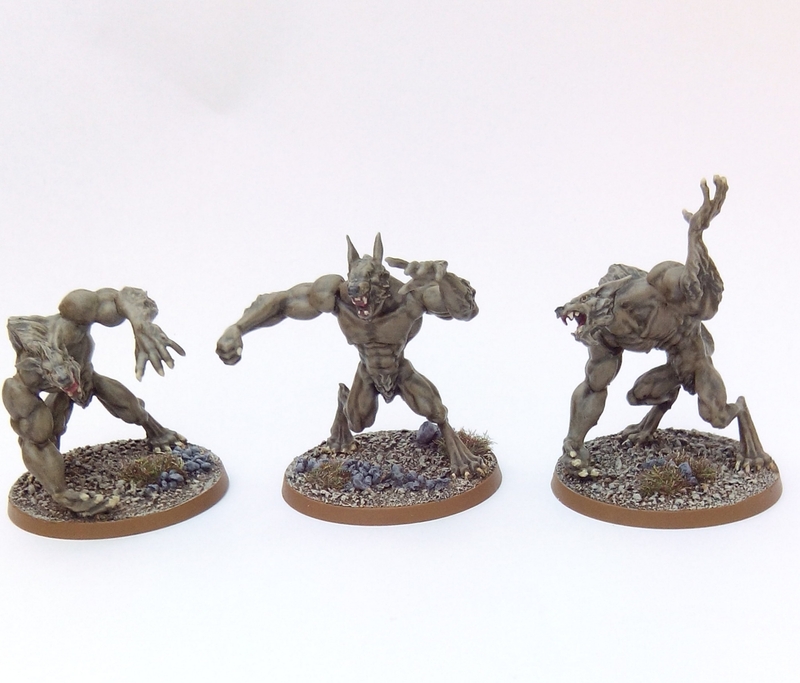 Enter my favourite love to hate miniature manufacturer – yes, you’ve guessed it – Mantic! As has been noted before on this blog Mantic’s output has been (to put it politely) inconsistent. Issues with moulding quality, consistency of scale and badly fitting parts are inexcusable complaints, something you’d probably expect from plastic models thirty years ago rather than modern companies like Mantic. That said there’s something about their ranges I find endearing in a ‘wargamer way’ so I’ve decided to experiment with some of their models using Army Painter Strong Tone dip. Werewolves. I got these on a whim really, the paint job on the Mantic website makes them look awful but they’re really not that bad. With a simple change of tail and trimming of ears I think these would make decent Rat Ogre alternatives. The skull chucker was too big to dip in the quickshade tin so I had to paint it on by brush, which worked out fine. 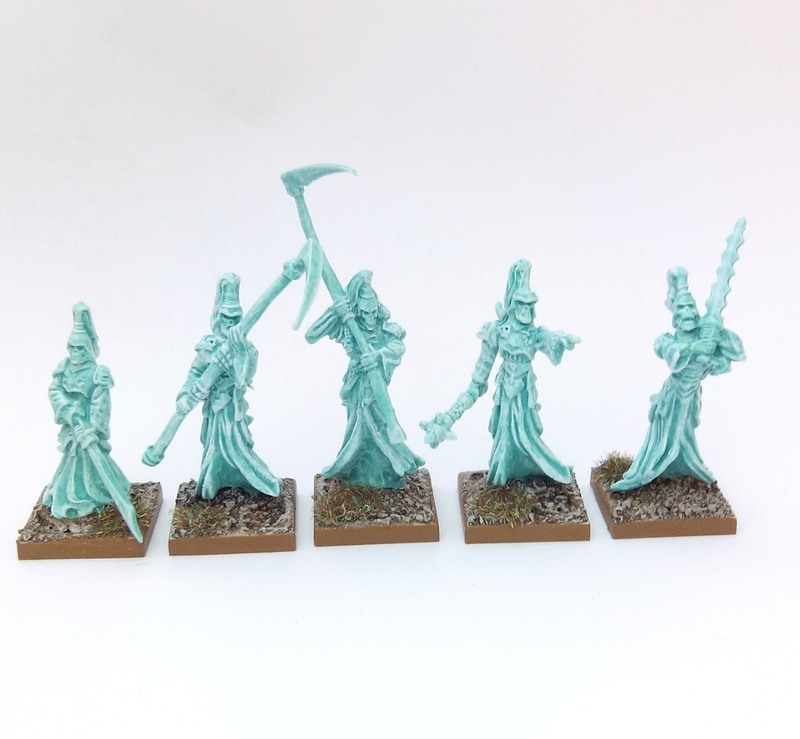 The Wraiths obviously aren’t dipped but are just simply washed with GW Nihilakh Oxide verdigris paint over a white undercoat and quick dry brush mixes of Vallejo verdigris glaze and white. Mummies. Pretty crappy but cheap. This was the first unit I tried dipping so I timed the whole process. From assembly to final varnish they took just over 6 hours (minus drying times). 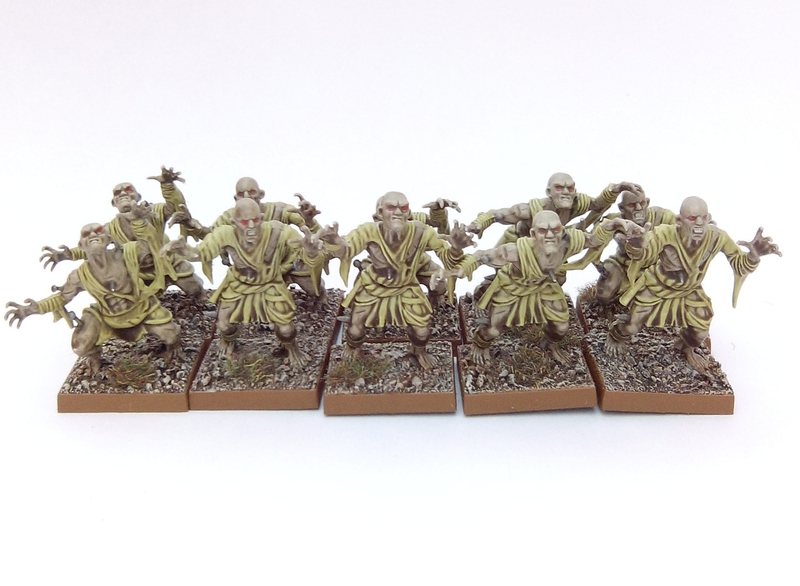 So just over 2 of my painting sessions to complete a unit of 10. Not bad in comparison to my normal painting output. Ghouls. 3rd time this sculpt has featured on my blog. Apologies. Skeletons. These are quite nice sculpts, among Mantic’s better efforts. 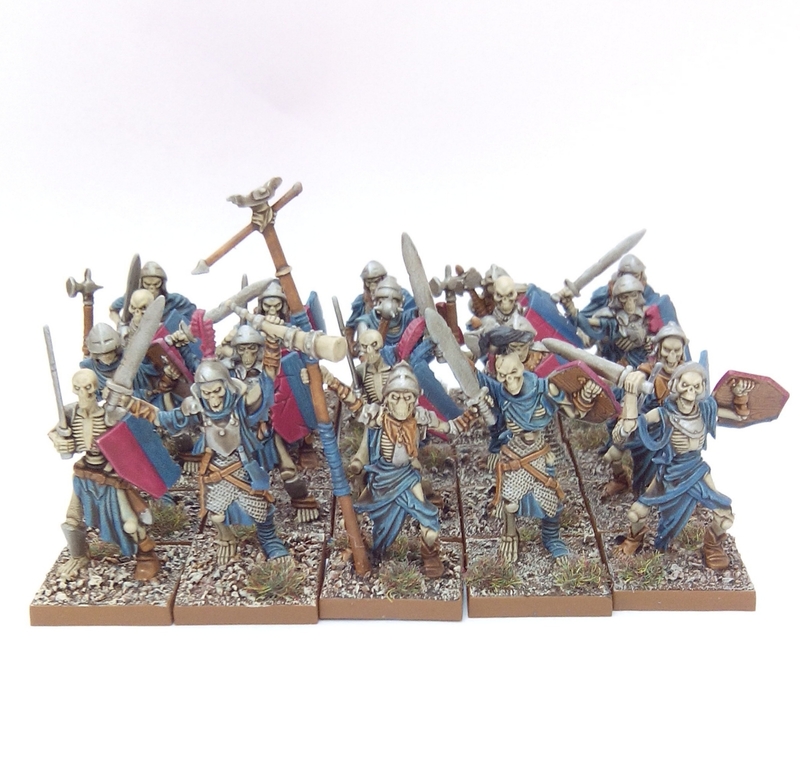 This entry was posted in Post-1990 and tagged Army Painter Quickshade, Kings of War, Mantic, Undead, Warhammer on January 19, 2016 by Hobgoblin Orange.